From the house and its front terrace there are wonderful views over the countryside and pine trees to he sea. 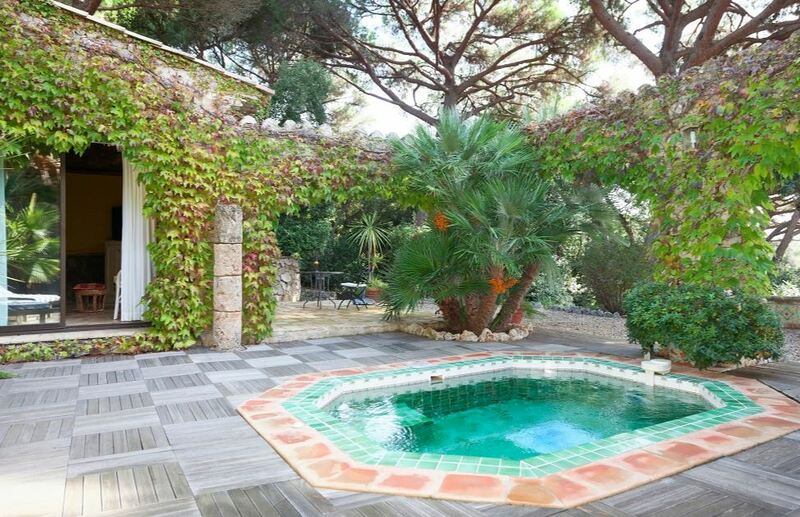 Surrounded by grounds of two hectares on several levels, with trees and a mature garden of flowering plants and vines. There is a vine-covered pergola at the front of the house, and outdoor dining area. Arches lead to a pretty courtyard with Jacuzzi. On a lower terrace, the next level down, is a large 15 x 6m swimming pool surrounded by a sun terrace with fountain, and a pool house with barbecue, fridge and guest accommodation. On the next level down is a tennis court, boules court and a children’s play area. The property consist of the main house, a studio which is just across the courtyard with Jacuzzi and the pool house. All interiors are tastefully decorated and furnished in a typical Provencal style, with terracotta tiled floors, beamed ceilings and antique furniture. There are three bedrooms in the main house. The master bedroom with en-suite bathroom is on the first floor. The double bedroom in the main house has been transformed into a parental suite with 2 extra single beds. The parental suite has its own seating area and terrace, as well as an en-suite shower room. There is another double bedroom on this floor, with en-suite bathroom . There is a double bedroom in the separate apartment, which is across the terrace with outdoor Jacuzzi, and 2 extra single beds on the mezzanine above. These two rooms share a bathroom. In the studio apartment there are twin beds with an en-suite bathroom. Finally there is 2 double bedrooms in the renovated guest house, located close to the main building, with a terrace and views of the sea, living room and en-suite shower rooms.